We're almost there! The end of the year draws near as do our free number games from MommyMaestra's exceptional sponsor, Spanish for You! You may remember that they are currently focused on helping students learn those higher numbers that come after 20 in class (you can find their earlier downloads here and here and here). 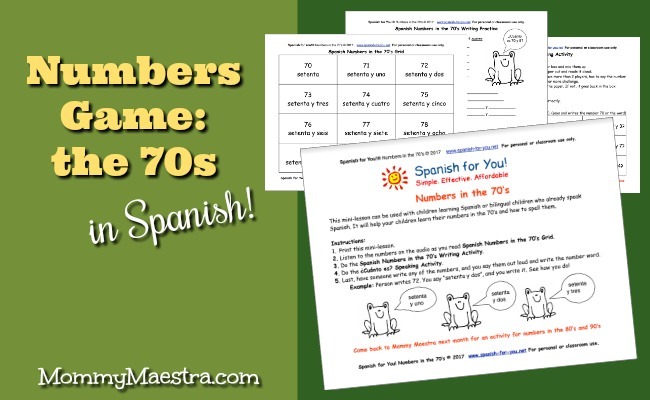 This 4-page mini-lesson will help your young Spanish learner memorize their numbers in the 70s, as well as how to spell them. The file includes a page of directions, a seventies' grid, a writing practice worksheet, and a speaking activity. As always, it comes with the audio file to help you learn proper pronunciation.